"Trying to live, trying to learn"
"Who's going to take care of Paul?" "Ebola Outbreak: How it began, how it continued, those it affected"
Pictures of the Year International occasionally recognizes meritorious coverage by visual journalists of significant news events or social issues from the past year. POY exercises this prerogative after judging has concluded and the acknowledgement is independent of the jury's decisions. Pictures of the Year International is proud to serve its educational mission. 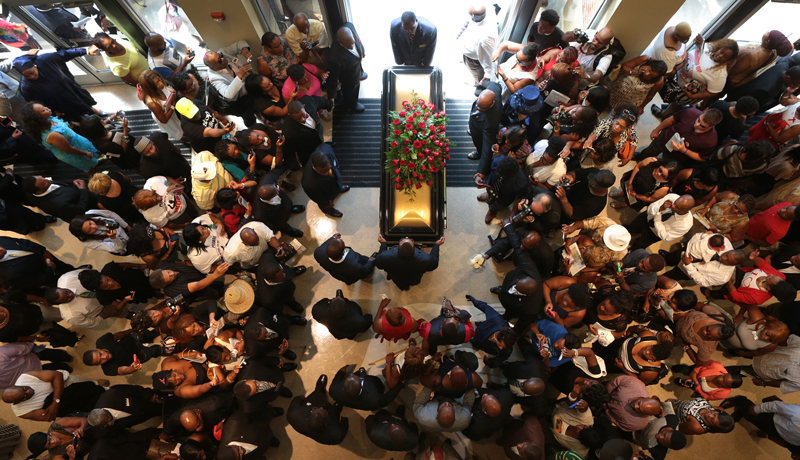 "Michael Brown laid to rest"
The casket of Michael Brown exits Friendly Temple Missionary Baptist Church at the end of his funeral in late August in St. Louis. While his family and the public awaited a grand jury's decision whether to indict a Ferguson police officer in his death, thousands attended Brown's funeral.